Donald Trump Makes Beer Great Again! This Presidential Beer Stein is the best beer stein ever created because it’s not FAKE NEWS. You won’t see this on the CNN (Clinton News Network). Believe me. 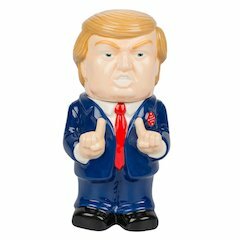 This novelty gift is going to be YUGE. It is hand crafted in the same remote Chinese village who manufactured Trump Neck wear, so you know that these mugs are the best. They are big, a full 22 ounces ceramic signature mug perfect for coffee, beer, tea, or your favorite drink. Each handcrafted mug features beautiful raised relief and authentic decoration, including Donald Trump’s famous mane. The head is cleverly hinged to allow pouring of your favorite beverage into the container. It’s made in China so we are not sure if there will be a YUGE tax on it in the coming months when it’s shipped to America. The box says it’s “Fun and Functional” and it is. 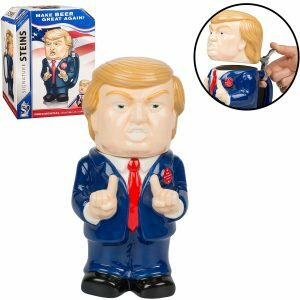 Because Trump doesn’t drink, these steins don’t allow easy consumption of alcohol, as the hinged head will bang into your nose. “As a stein it’s not that functional to drink out of, sipping a cold brew out of Donny’s neck isn’t a very ergonomic operation,” said an Amazon reviewer. “But I bought it as more of a novelty show piece anyway so it doesn’t bother me a bit. Available on Amazon for $29.99 and cheaper if you buy it used. If you would like to keep in the spirit of Trump by paying more than you should, you can find it on eBay for $99. Beer is not included. We know that because when we popped open Trump’s head we discovered his brain was empty.